If you want to learn how to tow a boat you've come to the right place. With this guide, you can begin developing your trailering skills today. Trailer boating has a number of advantages over leaving your boat in the water at a marina or pier: you can take your boat to new and far-flung cruising grounds, launch at ramps close to different fishing spots, and often save money by keeping a boat on a trailer. Align the hitch and ball, then lower the trailer hitch down over the ball. Close the latch and insert the safety pin. Cross the safety chains, and attach them to the truck. If your trailer has brakes, attach the safety line to the tow vehicle. Plug in the lights, and run a full check to make sure they're all working. There is one big challenge, though, particularly for those new to trailer boating: learning how to tow a boat in the first place. 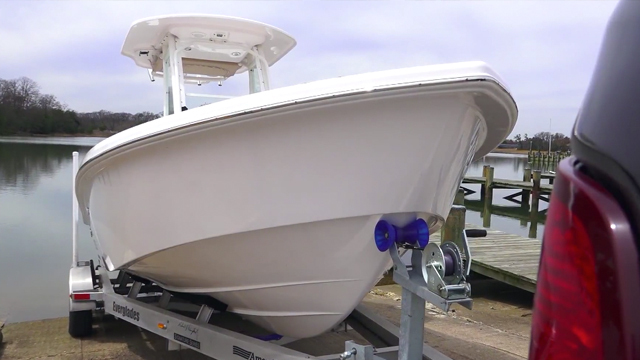 Never fear, new trailer boater—helping you understand the ins and outs of different types of boats and boating is why we’re here. And we’ve filmed several videos and written many articles that will help you ramp up your trailering skills. If you’re starting from scratch, the first thing you need to know is how to pick out the best truck or SUV to haul your boat down the road. In the video What to Look For in a Tow Vehicle, we cover all the bases and walk you through the things you need to think about before making your choice. In a nutshell, you need to consider the weight of your rig, the type of terrain you'll be navigating, and just how important your own personal comfort is. As far as weight goes, it all boils down to gross combined vehicle weight (GCVW). This number is the weight of your loaded vehicle, along with the total weight of your trailer and boat. Every tow vehicle is going to have a stated maximum GCVW. So break out a calculator, add up the weight of your boat, trailer, and vehicle, and make sure the vehicle you're considering has a GCVW in excess of that figure. Obviously, the tow vehicle will also need a set of towing accessories (commonly called a "tow package"). This includes items like extended towing mirrors, transmission coolers, and of course, the tow hitch itself. Hitches are rated by class, and depending on how heavy your boat and trailer are, you may need a Class I, II, III, IV or V hitch. Hitches that are Class I (commonly called "bumper hitches") aren't really appropriate for much more than a small sailing skiff, dinghy, or jon boat that weighs under 2,000 pounds. A Class II hitch is good for up to about 3,500 pounds, Class III goes up to 5,000 pounds, Class IV goes up to 12,000 pounds, and Class V can tow as much as 18,000 pounds. Beyond that, you may need to have a "fifth wheel," which usually sits inside the bed of a monster-sized pick-up. This, however, is reserved for very large loads and should only be considered by experienced towers. Wait a sec—if hitches are measured by class, why are we using qualifiers like "about," and "up to"? Because these figures aren't as cut-and-dried as one might hope. Accessories like weight-distributing hitches can change the capacity. Tongue weight also has an effect. Tongue weight is just what it sounds like: the amount of weight bearing down on the tongue of a trailer. Obviously this can change, depending on factors like the boat's load and where it sits on the trailer. Tongue weight should always be between 10 and 15 percent of the total boat-and-trailer package (gross towing weight, or GTW, which is the GCVW minus the tow vehicle's weight). If it is outside of these parameters, trailer sway is a distinct—and dangerous—possibility. You'll also have to take hitch ball size into consideration. Generally speaking, you can simply match the trailer hitch with the ball hitch you buy for your tow vehicle; trailer boaters with multiple boats usually choose a "receiver" hitch, which allows you to quickly and easily swap out different size hitches for different trailers. Finally, you need to consider your own comfort level. This is no different from picking out a car, and choosing between things like leather or cloth seats. But don't gloss over the details; while more features do add up to a higher price tag, they also can play a significant role in your long-term satisfaction with the vehicle. There are many factors that add up to a great tow vehicle: don't forget driver comfort. With a tow vehicle and a trailer boat sitting in your driveway, the next step is figuring out how to put the two together. Watch How to Safely Hitch a Boat Trailer, and you’ll soon be ready to roll down the road. Please, watch it before you try actually towing. There are a lot of specifics to remember, and you don't want to miss anything before you hit the highway. Close the latch and insert the safety pin. Never tow without the safety pin in place, because the hitch might pop off the ball when you hit a bump. Cross the safety chains, and attach them to the truck. They should always be crossed so if the hitch fails, the chains will support the trailer tongue and it won't dig into the asphalt. If your trailer has brakes, attach the safety line to the tow vehicle. (This will engage the brakes if, for some reason, the trailer comes free from the vehicle). The next item to consider is how to roll down the road safely. So now’s the time to watch Safety Tips for Trailering a Boat, and then check out 5 Tips for Towing: Get Your Boat and Trailer Down the Road Safely. 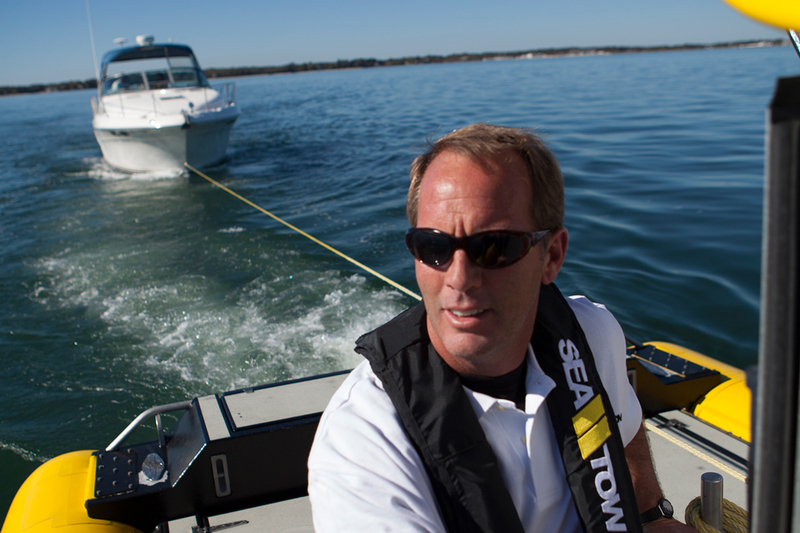 When it comes to boat towing, naturally, safety is the most important factor. 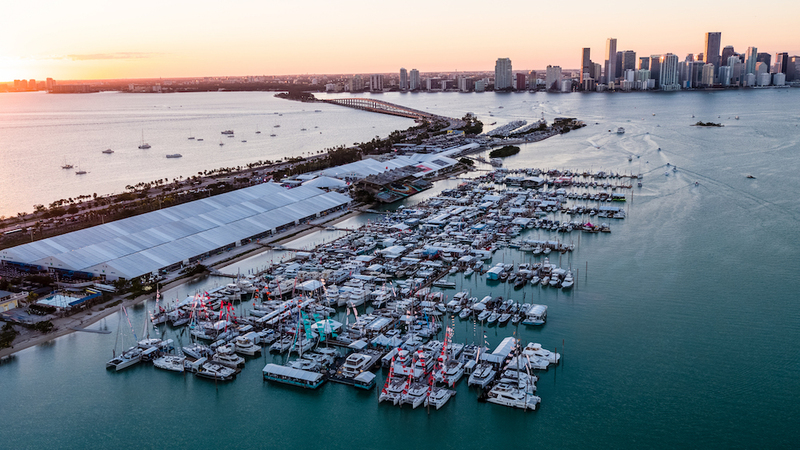 Although it doesn’t focus purely on safety, you’ll probably also want to read 10 Trailering Tips: Haul Your Boat with Confidence, since it includes additional good advice. 1. Before trailering, perform a full pre-tow safety inspection of your rig. (A complete list of things to check is in the video). 2. Tongue weight should be about 10- to 15-percent of your load. If it’s not, the trailer might sway. Swaying is extremely dangerous—if you detect sway in your rig, slow down immediately, pull over, and adjust your load. 3. Make sure your truck’s load is level and even, too. 4. Make wide turns to avoid clipping a curb or other obstructions. 5. Leave extra following room between your vehicle and those in front of you. When towing a heavy load, braking distance may be significantly increased. 6. When wind-blast shoves your rig sideways, you can minimize the effect by taking your foot off the accelerator. Do not step on the brakes. 7. Use your side-view mirrors. Your rear-view is useless because all you'll see in it is the broad bow of your boat. 8. As soon as you arrive at the boat ramp, walk back to the trailer hubs and check that they're cool to the touch. If they’re hot, your bearings aren’t functioning properly and need to be serviced immediately. 9. Don’t remove the winch strap and safety chain until you’ve backed the boat down into the water. If you remove the strap and chain too soon, the boat can slide off the trailer and smash onto the boat ramp. 10. Practice, practice, practice. Before you tackle any busy roads or long trips, take your rig to an open parking lot. Practice backing, turning, and making other maneuvers in a controlled setting. By now, you're probably wondering what all the fuss is about. 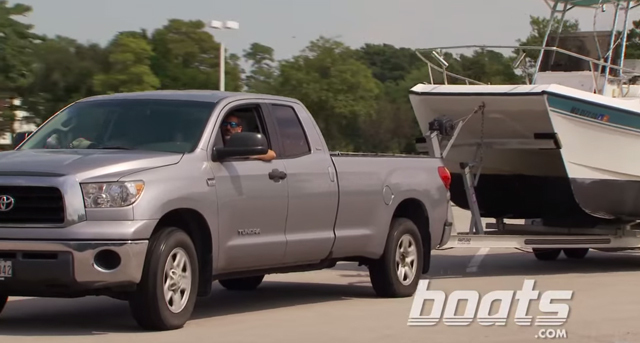 Can trailering a boat really be all that different than driving a car or truck? Well, yes. A trailer is a separate vehicle, and even though its power, steering, and braking are all being controlled by the tow vehicle, there's an entirely new set of problems that can arise. Before you take to the road, take a look through the article Boat Trailering Tips from an Expert. It points out five things that commonly go wrong when towing a boat—and explains how to avoid them. Whether you’re putting your boat into the water or hauling it out, you’ll have to master backing the trailer to get the job done. That's a maneuver that can be a challenge for even the most experienced boat towers. But never fear, dear friend. 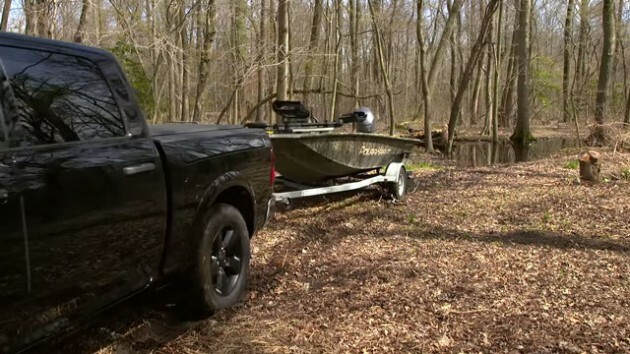 Watch How to Back a Boat Trailer Like a Pro, and you’ll soon be backing up like, well, a pro. Backing a trailer (whether down the boat ramp or into your driveway) involves some special skills and techniques. Practice. You'll never learn to effectively back a trailer if you only do it once a week (or once a month or once every few years), over a very short distance (as in, down the ramp). Take your rig to an open parking lot, and set out some cones (life jackets work in a pinch, though they're harder to see). Then practice backing between them, around them, and in and out of parking spots. Many people get confused when backing, and turn the wrong way. To eliminate this problem, simply put your hand on the bottom of your tow vehicle's steering wheel. That way if you move your hand to the left, the trailer will go left. If you move your hand to the right, the trailer will go right. 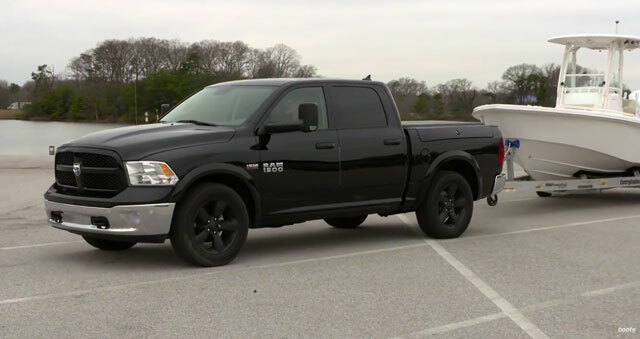 If your tow vehicle doesn't have extended side mirrors, get a set of aftermarket add-on towing mirrors. Glancing in the side-view mirrors is the best way to watch the boat as you back it up. Many beginners get flustered, because the boat never seems to back up in a perfectly straight line. But it's unrealistic to expect to be able to keep it perfectly straight, especially at first. Instead, concentrate on making constant, tiny corrections, as the boat veers a tiny bit left or right. Minor course corrections are to be expected—just try to keep them minor. If you begin backing up with the tow vehicle and trailer in alignment, backing up will be a lot easier. When you get to the ramp, for example, pull forward as much as necessary to get the trailer straight behind you. If you stop short and begin to back with the trailer cocked at an angle, it just makes the job that much tougher. Launching your trailer is easy if you follow a few step by step instructions. Load all of your gear into the boat. Remove the transom strap(s) from the boat. Put in the drain plug(s). Double-check to make sure you put in the drain plug(s)! If your trailer has incandescent light bulbs, disconnect the light plug. (Otherwise the brake lights will turn on when you hit the brakes, and while submerged, the heat of the bulb mixed with cold water may burst the bulb). 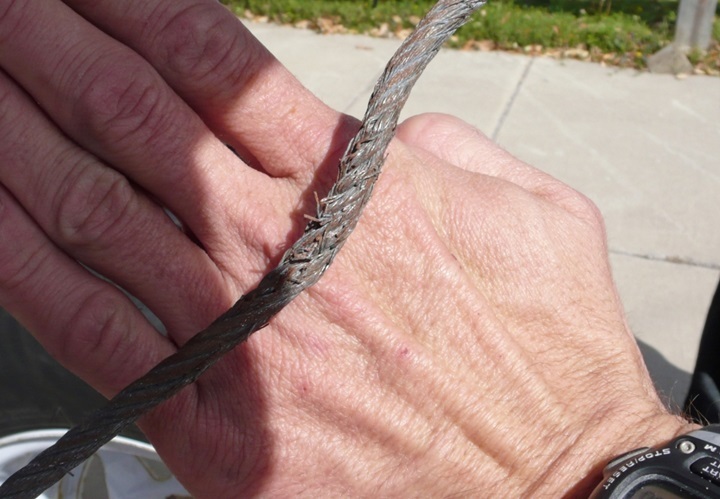 Prepare your mooring line(s), if necessary, and put them on the boat's cleat(s). Back the boat down the ramp until the stern begins to float, and the engine outdrive(s) are sufficiently submerged to pick up cooling water. Apply the parking brake to your tow vehicle, and in the case of large boats and heavy loads, it's also a good idea to chock a wheel. Finally, un-hitch the bow strap and safety chain from the boat. 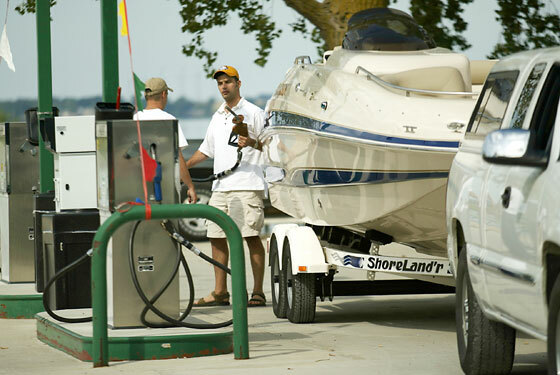 To get the boat completely off the trailer, start the engine(s), shift into reverse, and gently apply power. 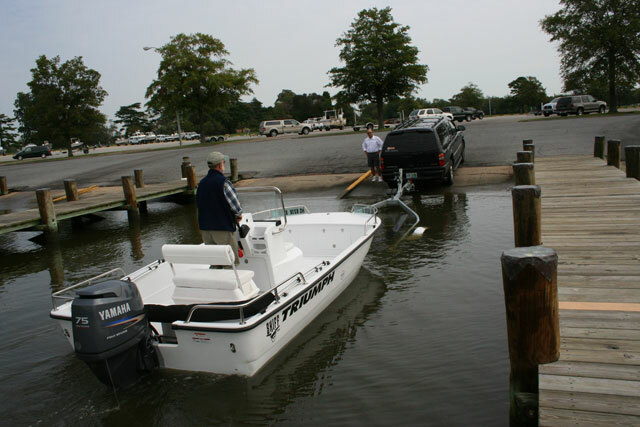 If the boat doesn't move, chances are you need to back the tow vehicle down the ramp a bit farther. At very busy ramps, you'll see a "courtesy dock" nearby. The idea of these is to keep traffic moving as quickly as possible. 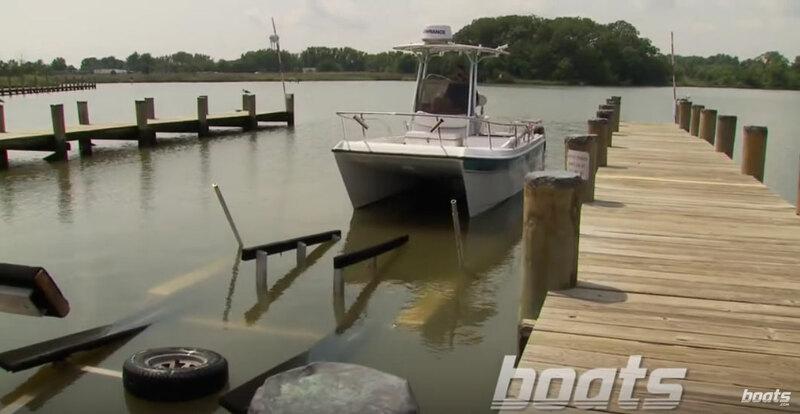 In this case, move your boat to the courtesy dock as soon as it's off the trailer so the ramp will be available for the next trailer boater to pull right in. When hauling a boat out on a trailer, a general rule of thumb is to back the trailer into the water about halfway. Hauling your boat out of the water is essentially performing the launching operation in reverse. But there are a few important items to bear in mind. First off, when you back the trailer down, be sure not to go too far. If you do, the bow of the boat may float right over and off the trailer. Though it varies from rig to rig, submerging one half to three-quarters of the trailer is usually about right. Though different rigs vary (and yes, this powercat certainly makes for an unusual rig), when you dunk the trailer for retrieval the front portion of the bunks or rollers should always be exposed, so the bow of the boat doesn't drift off to either side. It always takes a bit of common sense and flexibility to determine the best way to get the boat onto the trailer, on any given day at any given ramp. 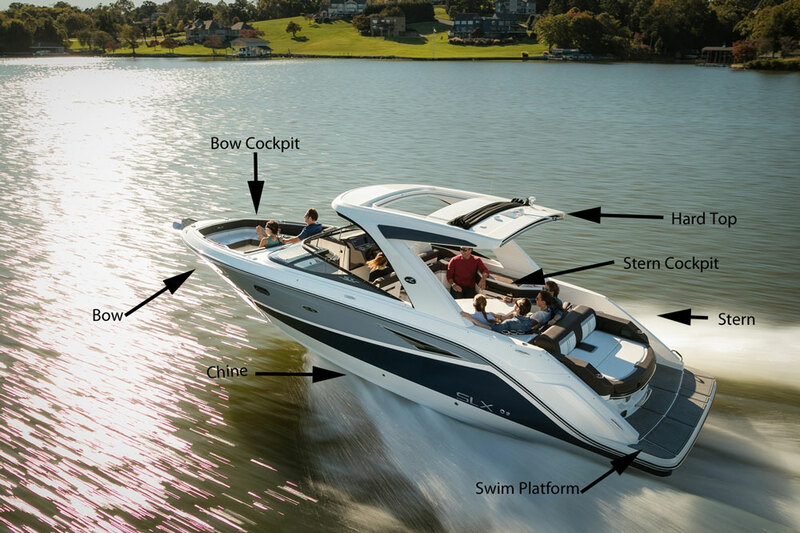 But whenever you use the boat's powerplant(s) to push it onto the trailer, make sure the boat is properly aligned—and apply that power judiciously. This isn't a race, and this isn't the time for haste. A word of warning: before applying any power, always make sure the steering wheel is centered. Otherwise, you'll drive the boat right out of alignment. Once the boat's up on its trailer, shut down the engine(s) and tilt up the drive unit(s). Re-connect the bow strap, and give a few turns on the winch to be sure it's good and tight. Then re-connect the safety chain, and you're ready to pull the boat out of the water. Ready for some more advanced info? Then it’s time to watch Tips for Launching and Retrieving a Trailer Boat. And if you’re new to boating in general, now’s a good time to watch How to Dock a Powerboat, too. 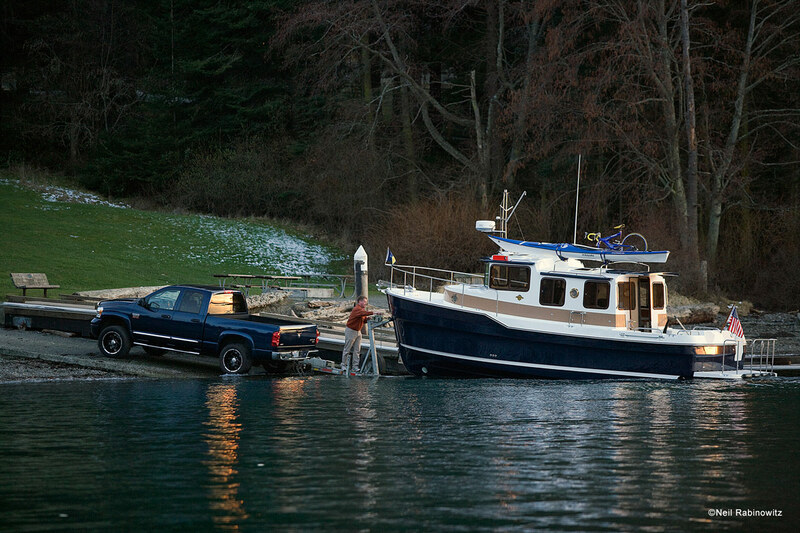 After all, you’ll probably need to dock the boat before you load it onto the trailer and pull it out of the water. When you do pull the boat out of the water, remember: don't stop right there on the ramp. Good trailer-boating etiquette dictates you should always strive to block the launch facility as briefly as possible, so pull up into the parking lot or off the side of the road before you begin preparing for the drive home. Lots of moving parts on a boat trailer means there will be some maintenance to keep up with. Whew! We've covered quite a bit of ground here, and at this point you should be more or less ready to hit the road and get on with your trailer boating adventures. But of course, there is some extra work involved in boat towing. And one biggie is the fact that you now have another vehicle to maintain. No, the trailer doesn’t have an engine of its own, but it is part of your rolling stock, and you’ll need to keep it in tip-top shape to ensure trouble-free trailering. Just like a car or a boat, every part of a trailer needs regular maintenance or it can deteriorate and fail. If you're a saltwater boater, the first and most important maintenance chore is giving the trailer a thorough rinse, as soon as possible after pulling it out of the brine. 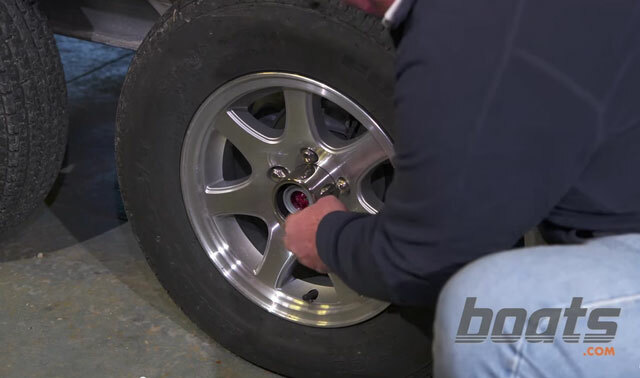 Some common problem spots that should get an extra dose of the fresh stuff include the brakes, wheels and lug nuts, lights, the license plate (yes, that will corrode too), and anywhere there's a nut, bolt, or screw you hope to be able to spin free one day. Don't forget to rinse the inside of the trailer frame too. Wheel bearings are an item to constantly watch. Always touch them after long drives, to feel if they're hot. If they heat up enough to be uncomfortable to the touch, they need to be serviced by a pro. TIP: never submerge a warm wheel bearing. It'll draw in cool water, displacing the grease, and fail very soon thereafter. Even if you leave bearing service to a mechanic, you should still give them a visual inspection and a shot of grease a couple times a season or every few thousand miles. But different manufacturers have different specifications, and tire size has an effect on bearing wear (small tires spin more quickly than large ones, when traveling down the road at the same speed). So your best bet is to follow the manufacturer's recommendations. Oil-filled bearings are, of course, a completely different animal. These remain sealed, and the average boater really can't do any maintenance on them. The one thing you can do? Before each and every trip, give them a visual inspection to make sure that the oil level is correct and there's no water contamination. If you spot either of these issues, call in a mechanic. Another common maintenance issue is trailer tires. Maintaining proper inflation can be tough, since trailers tend to sit for long periods of time (and go through significant temperature swings, which affect tire pressure) between uses. As far as tread goes, follow the same rule of thumb as you would with automotive tires. They should have at least 2/32" of tread depth, which can be measured with a penny. Hold it with Abe Lincoln's head upside-down and facing you, slide the penny into the tread, and if it's deep enough to touch Abe's head, you still have enough tread depth to hit the road. Some other parts of the trailer that need regular visual inspections include the jack stand, the hitch, brake fluid level, and the winch and strap or cable. Then, of course, there are the lights. We trailer boaters love to hate trailer lights. They fail on a frustratingly regular basis, season after season. That said, LED systems are a bit less horrific than incandescents. In the long run, all you can do is monitor them closely and fix them regularly. Many of these general trailer maintenance issues, and more, get covered in the video How to do a Seasonal Trailer Inspection. In The Outboard Expert: Check Your Trailer, Charles Plueddeman does a great job of explaining why tires are so important, and what to look for before you send them rolling down the road. If you’ve bought a used rig and it’s in need of some TLC, Trailer Love: How to Fix it Up Right will help you get a handle on fixes and repairs ranging from frame to bearings to wiring. While most of the information you’ll see in these videos or read in these articles applies to virtually all trailer boats, there are also some special towing circumstances you may face. Waterfowl hunters, in particular, will often encounter unusual boat-towing challenges. You may need to tow through mud or sand, or you may have to deal with sub-standard boat launches. 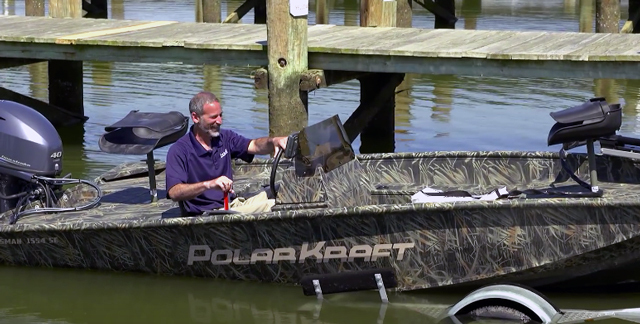 So we filmed How to Tow Hunting Boats to show you how to deal with those special challenges. 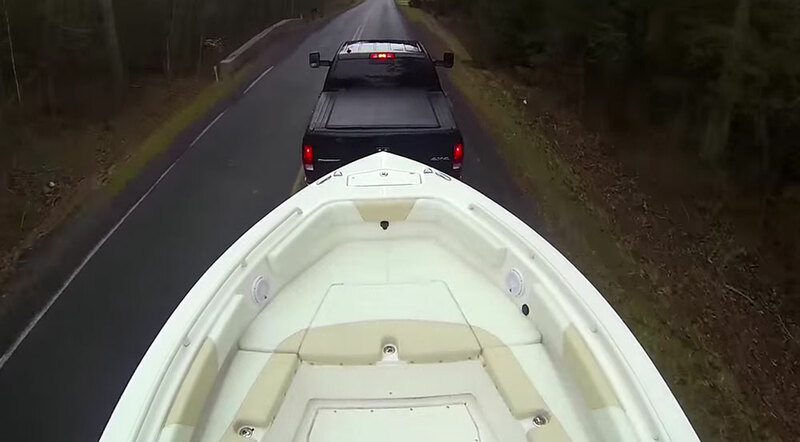 Trailering a hunting boat can put you in some unusual towing situations. If you go on long trips with your boat in tow, or if you live in the mountains, another challenge will be towing in mountainous terrain. This does present some specific issues you'll never deal with when towing on relatively flat ground, so get prepared by watching Towing in Mountainous Terrain. If you watch all these videos and read all these articles, will you be an expert on boat towing? Nah. I’ve been a trailer boater for over 30 years, and I’m still learning new things and making new mistakes every season. 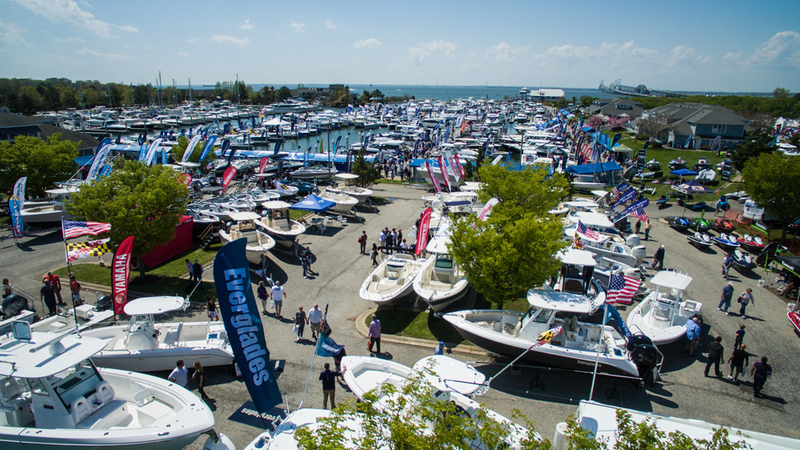 But one thing’s for sure: take your new-found knowledge and add in some boat towing practice and real-world experience, and you’ll have the confidence to tow your boat just about anywhere. Along the way, you’ll discover the joys of trailer boating—and we’re betting that you'll become a trailer boater for life.